I read this article and found it very interesting, thought it might be something for you. The article is called Artsdesk: National Memory Making and is located at https://www.totallydublin.ie/arts-culture/artsdesk-national-memory-making/. Building a national art collection is an act of national memory making. Choosing what to include in the collection immediately raises the question of what is excluded from the official narrative of a country’s visual culture. The curators of such a collection, then, have an unenviably tough role. How do you decide which works get to be part of the national memory? The whole enterprise becomes even trickier when funding is scarce, an issue the Irish Museum of Modern Art (IMMA) has encountered since the recession. Last year, the inaugural Hennessy Fund for IMMA Collection was announced, with the works of four Ireland-based artists (Kevin Atherton, David Beattie, Rhona Byrne and Dennis McNulty) admitted to the national collection. The three-year fund is intended to help the museum address gaps in its collection after a period of no funding. But, generous though the fund is, its size does not allow for ‘comprehensive’ collecting, as head of collections Christina Kennedy admits (Hennessy offers an annual fund of €50,000, next to the €600,000 IMMA formerly received). Within these financial constraints, which do not allow the building of a ‘complete’ canon of contemporary art, the curators for the fund (Kennedy, IMMA director Sarah Glennie and a guest curator each year) looked for ‘moments of strength’ in Irish art making. This year, the four artists whose work will be admitted to the national collection are Ciarán Murphy, Mairéad McClean, Mark Garry and Yuri Pattison. For London-based Tyrone artist McClean, the unreliability of memory and narrative is a theme that runs strong through her piece that’s been chosen for the collection, film work No More (2013). No More comes at childhood memory through bodily recollection. In 1971, when she was five years old, McClean’s father was arrested and imprisoned without trial by the British Army, as part of ‘Operation Demetrius’. This was officially presented by the Northern Irish and British governments as an effort to stem the tide of violence during the Troubles by targeting suspected members of the IRA (though ‘faulty intelligence’ resulted in the internment of individuals with no connection to the organization). * McClean’s memory of what happened is fragmented, the details hazy. I was 5 going on 6. I have memories of going to visit Dad in Long Kesh [prison], I’m not sure how many times, it might have been once or twice. I think I remember the night he was taken. But because my brothers and sisters talk about it now, I’m not sure whose memory it is any more. No More excavates the artist’s memories of this period, tracing the lines of the events through somatic or sensory memory. 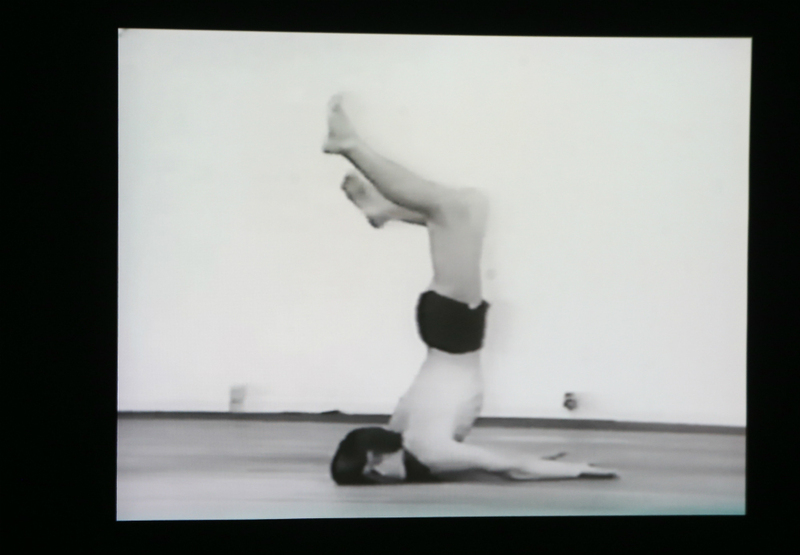 At the core of the film is a mesmerising piece of footage showing Polish actor Ryszard Cieslak demonstrating ‘plastique’ exercises, a form of movement derived from Hatha yoga and developed in Polish theatre director Jerszy Grotowski’s experimental theatre laboratory. The purpose of the movements was for training actors, specifically for ‘getting memories out’. The footage of Cieslak has something of the shamanic healer about it, or a conjurer or diviner. 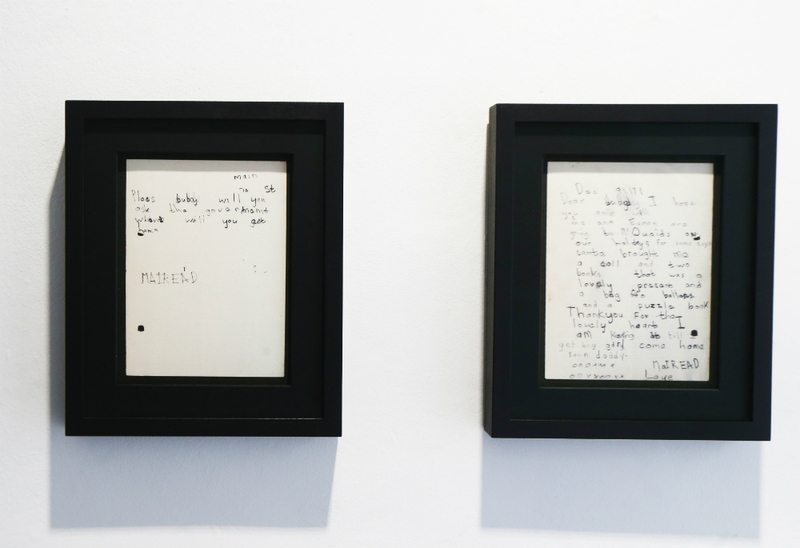 Frames showing his sinuous and utterly focused movements are interspersed with images from McClean’s childhood – a primary school reader and (one of the most striking and unsettling images in the film) a painstakingly penciled letter to her father in prison, asking him to ask the government when he can come home. The other major visual component is BBC archival footage of Brian Faulkner (prime minister of Northern Ireland at the time) announcing internment and making justification for it. The soundtrack is made up of remembered sounds from McClean’s childhood, and a recording of the artist as an adult speaking to her mother about events from that time. I somehow made the connection between opening up and closing down – someone doing this really experimental mind/body thing [in Poland], and then in another place my father being in prison and the connection with the memory of that and getting that memory out. And you’re right in saying that for me, he was like a diviner, a shaman. With the inclusion of the footage of Faulkner in No More, McClean tries to recontextualise a deeply resonant piece of history. And it’s interesting that this story of recontextualisation continues to unfold outside the artwork. McClean’s father is one of the ‘hooded men’, a group of survivors of internment who are currently embroiled in an ongoing court case to have their treatment while imprisoned redefined as torture by the European Court of Human Rights (it was originally defined as ‘inhumane and degrading treatment’). My father is in his 80s now and it won’t change his life. He resolved it long ago in his head, but he believes it’s the right thing to do for future legislation. I flip it from a negative to a positive. She’s talking about the appearance of the image on screen, but she’s also talking about something more than that. Also intent on excavating childhood memories is Mark Garry, another of the four artists admitted to the national collection this year. Garry is probably best-known for his colourful string installations, but the piece chosen by the Hennessy panel is a film work, North of the West (2017), that draws a line between the thrall in which both the ocean and Catholicism held him as a child. When I set about making the film, I’d already done a couple of projects dealing with religion. I was interested in the idea of how people of my generation are culturally Christian or Catholic and how it’s a very defining thing in terms of not only your moral code but also how you plan your week, how you speak about things – it’s an all encompassing element in one’s life. As a child I was enthralled by the beauty and grandeur of it, but also kind of terrified by it, the idea of this omnipresent thing that was fully aware of all of our thoughts, and I remember as a child going to the sea for the first time and being struck by a similar feeling, how beautiful it was but also terrifying. 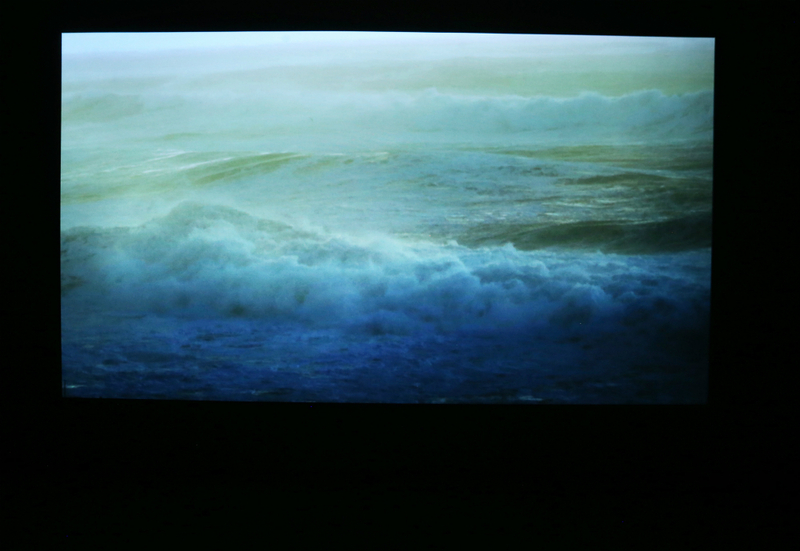 The piece was filmed off Mullaghmore peninsula in Sligo and the soundtrack, which visitors to the exhibition can choose to play or not on a record player as they view the film, was taken from a different project Garry worked on with musician Sean Carpio, DRIFT. For DRIFT, the pair turned a boat into an Aeolian wind harp and sailed the audience out into the natural amphitheatre of Horseshoe Bay off Sherkin island during Cork Midsummer Festival. A brass section and sax soloist remained on the beach playing. The connection with the ocean is clear, but the score also has a deeper connection with religion too, with Carpio basing the composition for brass and sax on Sumerian hymns. These were the first ever documented songs from Western Mesopotamia. So both the soundtrack and the film have this relationship with God in a very obscure way. Garry is interested in creating space for interpretation and personal association in his work, in foregrounding ‘the poetic over the didactic’. He thinks this is increasingly important at a time when we’re bombarded with information and, therefore, desensitised to it. That’s something I’ve been really conscious of for a very long time. To enable quietness in your life, because we’re so bombarded. When people think of the avant garde, they think of it in this straightforward way of ‘let’s confront something’ and that confrontation always seems required to be a loud one or an aggressive one and that’s why I’m such a fan of John Cage, because he saw that the idea of moving culture forward in a quiet way could be more impactful. And this bombardment requires us to have a very quick reading of the world – so I’m really interested in the idea of a slower, deeper way of engaging with the world. Like McClean, Garry strongly believes in the ability of the emotional or physiological impact created by art to ‘break through’ and make an impression on the viewer in a way that logical or argument-based information often doesn’t. While a national art collection is indeed an act of national memory making, the deliberately open and emotional nature of the works acquired means this narrative is one with many sides. *McClean disputes the official description of these events and contends that Operation Demetrius was prompted by violence arising from Civil Rights marches, protesting for equal rights for all in the North. Her father, as a member of the Civil Rights Association, had no connection with the IRA.